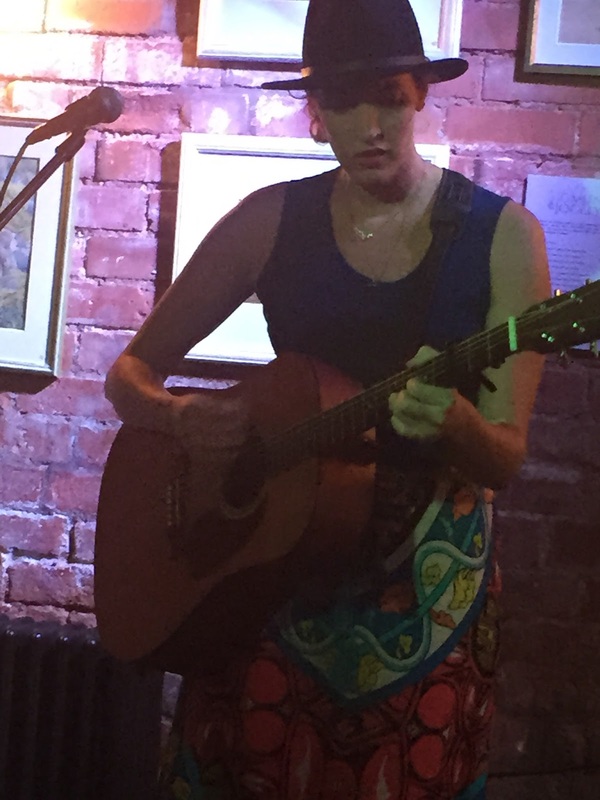 The last time Hannah Aldridge played a show in this area there was the rather bizarre sight of an inebriated couple slow dancing to one of her classic songs based on the true story of a woman serving a death sentence for killing her husband. It is glad to report that the level of audience sophistication was improved, as this time the location was elevated from a Friday night free pub gig to one of the region’s premier intimate listening venues. The song in question, ‘Parchman’, still retained a powerful place in the set list as Hannah paved the way for the next phase of her career. It is now around eighteen months since the music of Hannah Aldridge was first introduced to folks in the UK and many members making up this Kitchen Garden Café gathering were amongst those instantaneously hooked into her sound upon first listen. Hannah has subsequently played many gigs on her numerous visits to Europe since this introduction and now the time is fast approaching when her outstanding album RAZOR WIRE is going to be joined by its follow up. The premiering of the new songs continues via the craft of a singer-songwriter capable of extracting every sinew of emotion from an upbringing and existence deep rooted in the soul of southern soil. Economics dictate that Hannah tours solo, but she shared the intimation that the new record is likely to take on a more southern rock feel and we were asked to use our imagination to visualise. This was not too difficult with the track ‘Aftermath’ which increases the anticipation for the new record with its hopeful release date of early 2016. Another new song ‘Birmingham’ was first heard live at that Bromsgrove pub gig back in March and Hannah now had the opportunity to play it in the namesake to the town of its origin. The less than salubrious inspiration for the song was gladly not replicated by a more refined audience in the UK's Birmingham. Whilst there is a significant sincere and earthy edge to Hannah’s music, a touch of distinguished Gretchen Peters was detected in ‘Gold Rush’. This trio of new songs herald a giant wave of optimism that Hannah’s next project has the potential to be another gem. Without the need to be over repetitive, RAZOR WIRE is full of past gems and a vast majority of its content was liberally spread across the pair of sets that formed this excellent gig. The extraordinarily moving piece ‘Black and White’ was the suitable encore number and the anger driven ‘You Ain’t Worth the Fight’ is the ideal launch track to introduce an artist striking in poise, grace and passionate song delivery. Hannah was appearing straight after a couple of sets at the weekend’s Maverick Festival and shed any traces of exhaustion to appeal through a confident, upfront and articulate persona. With a scholarly view of what makes Alabama, and more precisely Muscle Shoals music special, Hannah widens her appreciation of great song writing with a cover of Jackson Browne’s ‘These Days’ and pays tribute to her own father Walt Aldridge with a version of one of his hits, ‘Modern Day Bonnie and Clyde’. While like so many artists, Hannah is far from genre bound, the foundations of her performing status are built on the classic sounds of country and folk which nowadays finds more appreciation within the burgeoning Americana movement. 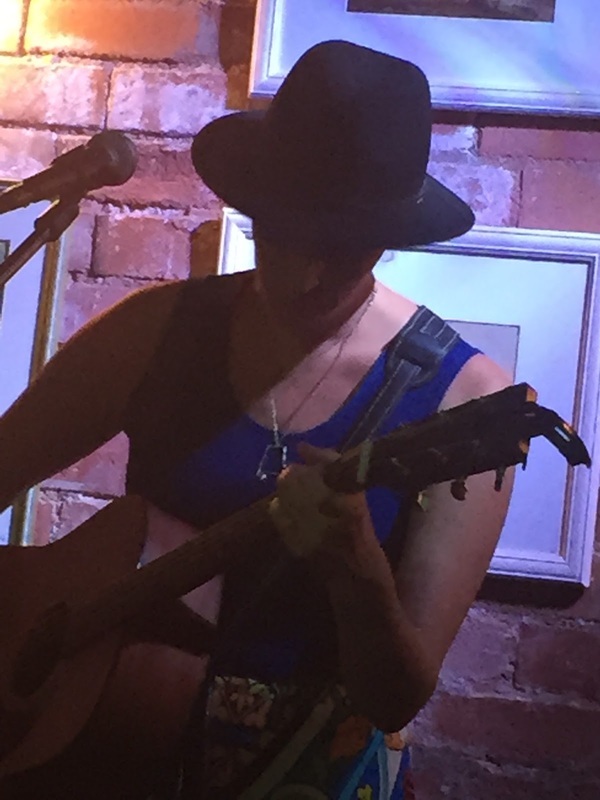 Just as Hannah impressed in that pub location back in March and in her appearances at consecutive Maverick Festivals, this Kitchen Garden Café performance further re-enforced the view that we are fortunate to be blessed with her presence on our shores. There is no reason why the stock of Hannah Aldridge cannot continue to grow in the UK over the next few years, with the next big move being the new record. Few, if any, liberally minded music followers fail to be impressed when listening to her records or more profoundly being present at a live show.